English is the official language of Jamaica but we also speak a dialect or patois. On your Jamaica vacation you will hear our dialect or patois vocabulary that is partly taken from our African and English ancestors. Remember we are a mixture of people so some of our patois has inflections from Spanish, Arawak and East Indian, to name a few. Jamaican's voice has a musical lilt and staccato rhythms with the mingling of strange words, with vowels sounding different or strange to your ear. Some linguists thinks patois is a separate form of speech, while others think it is an alternate form of English and find it very difficult to understand. You have to understand patois to really have an insight into the Jamaican sayings and culture. Think how great you'll feel understanding patois. Natty dread: means Person with dreadlocks, a Rastafarian. Some of the best anecdotes and fables are told in patois, so understanding its structure can add to your insight into the Jamaican culture. Just like the US, new words are created and used generally while others fall from grace. Some of the words of patois is taken from Spanish, Arawak, French, Chinese, Portuguese and East Indian languages. Rastafarian are relatively small in their numbers, but they have injected several grammatical concepts into Jamaica's patois. They use "I"as a substitute for "me". Proverbs and place names are expressed in patois. For instance: "You lay dow wid dawg, you get up wid fleas" means if you hang with troublemakers you will be influenced by them. Patois is very creative and is still an evolving idiom with new words being constantly coined to suit every development. These new words are being used often and is part of the daily conversation. At the same time some of the older phrases are disappearing or just not being used as often so they are disappearing from the memory of the younger generation. 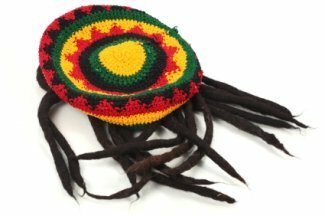 The Rastafarian changes to the Jamaica patois is a more recent phenomenon and not everyone has adapted to some of those changes and pronunciation. But come to Jamaica reggae music vacation and learn some new words and have some great fun. Dialect are spoken around the world. Share your dialect or patois along with their stories and origination on the form below. Write your review about what you think about Jamaica's patois or dialect. Did you learn any Patois. You know proverbs and place names expresses the story. So translate the patois by telling us a story.